As a small business owner or manager, decision making tips help you face different types of problem solving challenges quickly. Use an ethical decision making model for all types of decision making. But often the decision making process is reactive: small business owners and managers do not have time to think through the pros and cons, and assess the value of the choices. So you make the decision, under pressure; sometimes it's not the right, or the best, decision. Have you thought about what takes you to that point? For managers and owners, the best types of decision making strategies are ones that are used to develop a process that can be used time and time again. A process will let you develop the criteria, review it, and make the right decision. But be careful that you recognize the difference between the decision making process and making the same decision over and over again (while thinking it worked before, it'll work now). The circumstance of each outcome needs to be reconsidered in the context of your decision making process. Adjust the process as necessary. Assess the outcomes from your decision making process. Track the results. Use the process you have developed to make both large and small decisions. 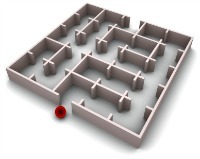 These decision making tips will help you navigate 'the maze' and keep you focused on developing a process that you can use regularly; work with the types of decision making strategies and tactics that fit specific types of problem solving issues. Your process may not be necessary for all the choices or decisions you might face; but once you develop the habit of working within a clear structure, it will come naturally to you. You can also use build these tips into your problem solving techniques. What? Definition of the decision to be made: What is the issue or problem or choice? Assess the impact of the outcome on your business and on stakeholders. When? Timing: when does the decision need to be made? Who? If you have employees working for your business, try to keep the decision making level to the lowest level NECESSARY. Obviously deciding on adding a new product, or business growth through acquisition or merger, etc. needs to include you as an owner. But hiring, buying, customer service decisions, and more, can be made by your employees if you have trained and developed them to be decision makers. Why? Define why a decision is necessary. Also, why is one decision better than the other? Have at least 3 or 4 or more reasons why; preferably these will be quantifiable reasons (always measure business performance as a regular activity) focusing on why deciding one way is better than the others. Once you've documented your specific decision making process, then write down the choices or options. Try to think outside of the usual or standard. For example, if you're looking to expand your business or chase after a very significant order or customer, rather than put together only the options your business has in front of it, also consider an alliance or partnership with a 'friendly' competitor as one of your choices. And, if you are trying to choose between funding new equipment on your capital expenditures plan, or replacing an old piece of equipment, consider the payback and look at your financial ratios to support the strategy and the outcome. You may need to do some considerable research and planning; particularly for the more significant decisions facing your business. Then assess the choices you've compiled and list what you consider to be the best-fit choices and the worst-fit. If all the options look good, or bad or neutral to you, start listing why and put a value (out of 10 perhaps) on each reason. This part of the process is always easier when you can eliminate some of the choices very quickly. For example, cost is too high, requires more land, requires significantly more staff, etc. In today's business environment, some of the more significant problems and decisions are related to ethics; use an ethical decision making model to help deciding on those issues. An ethical decision making model is created from the decision process and directly related to the organization's policies, values (and value statement), local, regional and national laws and regulations, as well as the business' concept of what is right and acceptable. Once you've completed your research, begin to review which are the best choices, and which are the worst. Take the worst off the table. Assess what's most important to you and your business: Do you need quick sales growth? Then acquiring a competitor might be a good decision. Do you need to expand your market? Then deciding to open several new, key branches might be the best fit for your business. Make sure you clearly understand the positives and negatives of each choice. For big issues or challenges, build a business case - your objective is to have the decision be the most obvious one, and the right one. However, not all your decisions will be the right ones. It is not possible to be 100% correct all of the time. So learn from your mistakes: what works for your business; what doesn't work for it. Do not allow your business to be stalled because you are afraid to decide. Rather take the fear out of decision making by trying to make it a relatively easy process. Use your best-fit decision making tips to help you make the best decisions. If you need to make the same type of decisions frequently, make a checklist. Create your own decision making tips that are specific to your business. For example, if you are recruiting employees, create a list of the characteristics and attitude most important to you. As you interview candidates for the job, think about that list (create questions to get answers that focus on those traits) and after the interview is over, rank the candidate from a range of one to ten. This simplifies the process - highest score wins the job. Or develop a decision tree, which is a technique you can use to visually see the impact of your choices, and decisions. For example, your tree starting point would be deciding where to locate a new, physical storefront. You would consider direct cost (e.g. purchase or lease of the building/space; signage; property taxes); indirect cost; and impact on sales (e.g. traffic, visibility, neighbors). Every small business owner has to make decisions, likely on a daily basis. The way to get good at deciding amongst a variety of options or choices is to practice the process. Make decisions often and you will find it gets easier every time. Use these decision making tips to improve your decision outcomes. Success at managing your business depends on your ability to make good decisions. Find out about growing your business (even through a recession cycle). Or Return from Decision Making Tips to More For Small Business Home Page.